Friday November 16th 1894 It was cold and windy today. I did some sewing besides the house work. I changed the buttons on my cloak and the collar on my new dress and worked on my calico dress in the evening. The boys are husking corn. 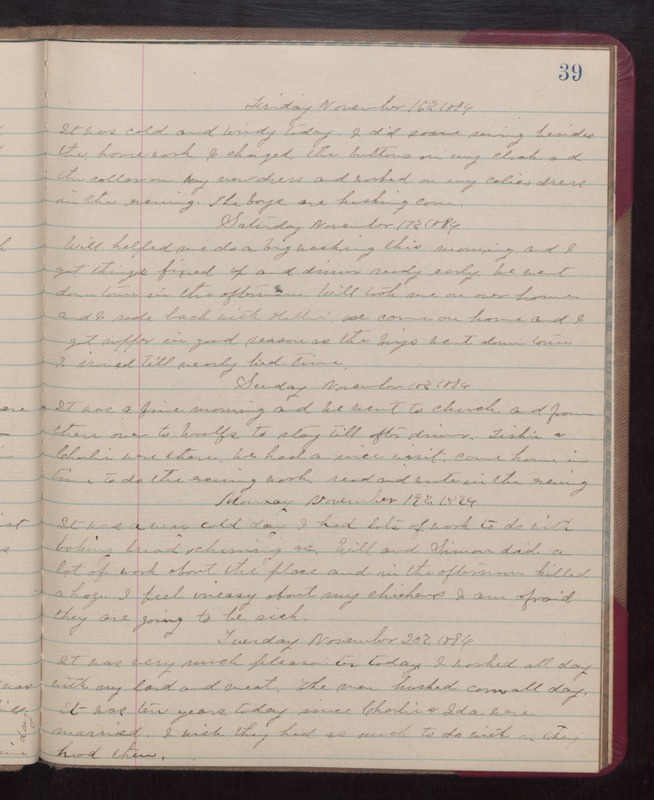 Saturday November 17th 1894 Will helped me do a big washing this morning and I got things fixed up and dinner ready early. We went down town in the afternoon. Will took me in over home and I rode back with Hattie. We come on home and I got supper in good season as the boys went down town I ironed till nearly bed time. Sunday November 18th 1894 It was a fine morning and we went to church and from there over to Woolfs to stay till after dinner. Tishie & Charlie were there. We had a nice visit. came home in time to do the evening work. read and wrote in the evening. Monday November 19th 1894 It was a very cold day. I had lots of work to do with baking bread, churning &c Will and Simon did a lot of work about the place and in the afternoon killed a hog. I feel uneasy about my chickens. I am afraid they are going to be sick. Tuesday November 20th 1894 It was very much pleasanter today. I worked all day with my lard and meat. The men husked corn all day. It was ten years since Charlie and Ida were married. I wish they has as much to do with as they had then.